The ML220R or "Rocker lifter" is the first demountable lifter pair, where the frame and lifting mechanism are combined in one unit. This reduces the weight, costs, installation time, and makes for a more robust lifter. One of the main advantages of the demountable lifter is that it can easily be fitted or removed, this in turn means reduced downtime and greater flexibility. The ML220R is a split "high level" lifter, which means that you can continue emptying bins whilst the truck is compacting. As a result you can empty over 1200 bins per 8-hour shift with this lifter. The ML220R is supplied as a complete unit, ready for mounting on the vehicle. All that the vehicle requires is for the base plates to be fitted and the side locking- plates to be added. No additional bodywork is needed. As with all Mechlift lifters, you will find that mostly standard parts are used, this means spares are readily available and affordable. The ML220R has been locally designed and manufactured for South Africas unique conditions, whilst complying to European and DIN bin standards. 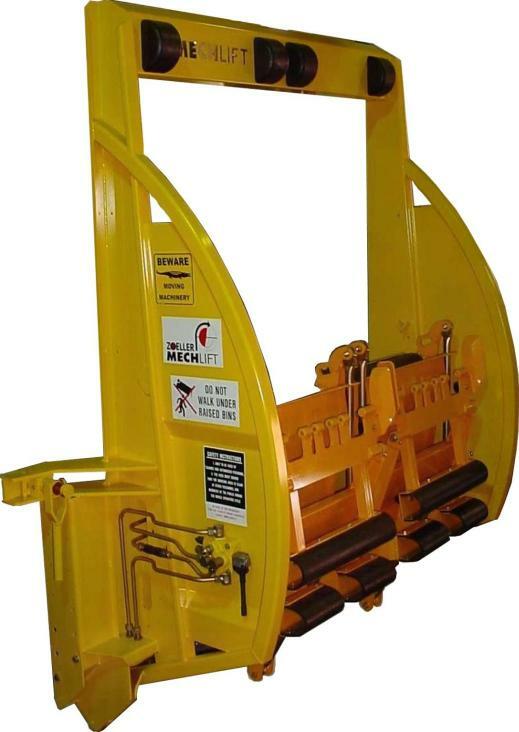 No tools are required to remove or re-fit the lifter and because of the unique rocker design, once the lifter is on the ground, it can easily be moved and manipulated by a single operator. This makes servicing skips a pleasure and means that the lifter is easily interchangeable.